I visited my parents this week, and my Dad had offered his assistance in helping me with an art project. 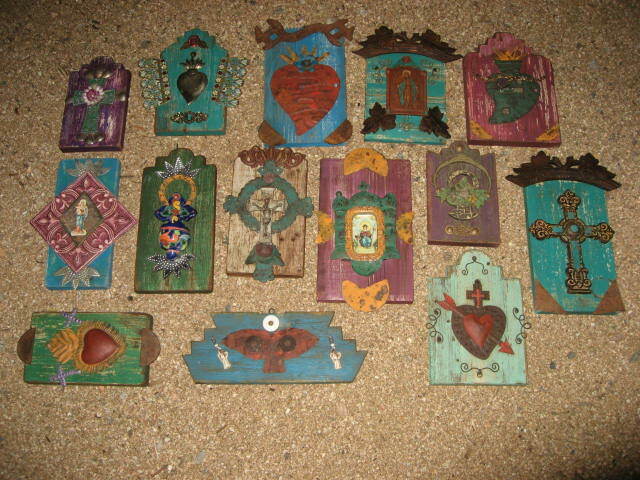 I chose to take some old pieces of wood to cut out retablo-esque shapes. 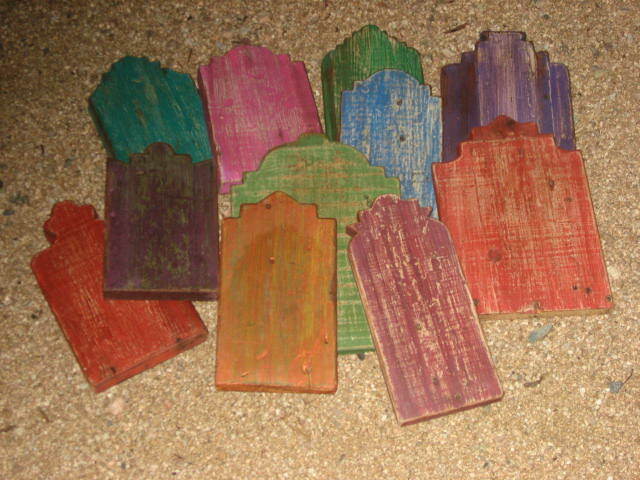 Dad did the cutting, then I filed and sanded each piece, readying them for painting, patinas, and embellishments. My art is really foriegn to my Father…after all, I have a hard time explaining what I do and why I do it, myself…but he’s happy to offer up his time and labor, and is proud of me as I pursue my creativity – even if, as I suspect, he finds my work rather odd. For more Haiku My Heart, visit Rebecca @ http://www.corazon.typepad.com/. ~ by Dawn Elliott on July 14, 2011. “Thats what Dads are for ” would be what my husband would say! I’m happy for you that yours is there to lend a hand. As a Dad, I can tell you, it might not even be about the art. To stand side-by-side with a daughter is priceless, no matter what the endeavor. Your pieces are beautiful. Your Dad does a good job. Makes me motivated to do something, but I have been so busy with so many other things this Summer. This is when i should be making snowshoes, (I have one order to prepare before Winter), but the nmotorcycle has taken center stage. Wonderful! How lucky you both are to be able to share this time with each other. Here’s to Fathers and Daughters!!!!!!!!!!! YAY for your Dad and for you too. Love your patinas and art as always. Your haiku is so tender and there’s so much love in it… it’s almost like being with my own dad! i love this dad honoring. it is so lovely when the hands and hearts of a father and child meet in creation. Yay that your dad is able to treasure his “kooky” daughter, whether or not he understands. What I wouldn’t give to hang out with my dad once again. What special moments for the both of you and I bet he understands you far better than you imagine. I love your end products. How fabulous that he shows his love for you in such a palpable way. Even if he doesn’t understand your art, he respects your creative spirit. That is more than many daughters have. I am glad for you! Lovely work! You are so lucky to have these special moments with your dad. It’s real love when dads dive in, even if they do “get it”. I think the heart on the lower left would be the perfect gift for him.